Are you wondering how to train your Chihuahua? Don’t worry – we are here to help with our training tips for Chihuahuas. Start reading today! Alpha Leader Position: It is important to establish your alpha leader position with your Chihuahua from an early age. This will show your Chihuahua that you are the leader of your pack (family). You can establish this by always eating before your Chihuahua and not giving your Chihuahua attention for the first five to ten minutes after returning home. 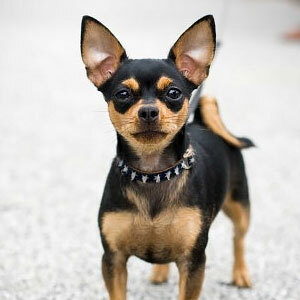 By establishing your alpha leader position your Chihuahua will feel calm as they know you will protect them. A Chihuahua who feels safe and calm will be much easier to train than an anxious Chihuahua. So it’s important to establish your alpha leader position before commencing with other training. Chihuahua Leash Training: It is so important to leash train your Chihuahua. If you have your Chihuahua off the leash in a public place they could end up in a fight or even run into traffic. Before you start leash training you need to make sure your Chihuahua is calm. An excited Chihuahua will be more difficult to leash train. If your Chihuahua is too excited, play with them in the backyard to tire them. Once you’ve done this it will be much easier to have them on a leash. If you Chihuahua pulls on the leash use the command ‘stop’ and discontinue walking. Get your Chihuahua to sit before you continue on. By saying ‘stop’ and actually stopping each time your Chihuahua pulls on the leash they will soon know that pulling equals stopping. A Chihuahua would prefer to keep walking so they will soon learn not to pull on the leash. Obedience Classes: Another important training tip for Chihuahuas is enrolling in obedience classes. You can learn some of the best training methods from an obedience class. They will teach you exactly how to establish your alpha leader position and how to give powerful commands. So if training your Chihuahua at home is not exactly working out, then it may be time to start looking into local obedience classes. It could be one of the smartest things you do for your Chihuahua! Consistency is the Key: There are plenty of training tips for Chihuahuas – however the most important of these is consistency. You need to be consistent in every aspect of training. If you let your Chihuahua on your bed as a treat, but they are not usually allowed to do this, then they will get confused. So stay consistent – never ever let your Chihuahua on the bed if this is not normally allowed. The same is for all other aspects of your lives. If you teach a command one way then do not change it later on. Your Chihuahua will only get confused and this will just make the training process go on for longer. Consistency is the key to a well-trained Chihuahua! Training your Chihuahua will not happen overnight, but it will happen. Just remember, it will take time and patience. If you put time aside each day for training you will soon you will have a well-trained Chihuahua. So take aboard these training tips for Chihuahuas today!